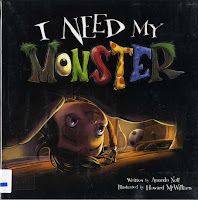 Every month, I've been recommending new and fantastic picture books for our bookletters service. We're looking at migrating over that service to a blog format and this is a trial run. 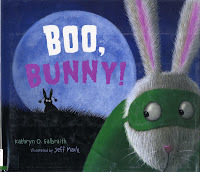 So here are some fantastic picture books for October. Some are pure Halloween fun, but others feature ghouls, ghosts, monsters, and witches dealing with life on every other day of the year. But all of them are new, shiny, and fantastic. Enjoy! Congratulations! Your monster is growing up, and up, and UP! Now it's time to potty train him! Potty training is not always the easiest task to navigate-especially for growing monsters. Thankfully, with the help of this easy-to-use guide, young ones can be sure not to forget any steps in the process. With hilarious text and playful, energetic illustrations this potty training guide is a must-have for little kids and little monsters everywhere. Check the Library Catalog for this item! The harvest garden is bursting with delicious vegetables, the pumpkins are decorated and lit, and the mice have their costumes ready. Everyone is looking forward to the annual Halloween-night feast. Scary Cat wasn't invited to the party, but he seems to think he's coming anyway. Hmmm, time to come up with a clever mouse-style trick to outsmart him! Done in Ehlert's beautiful and signature collage style, these mice might inspire your own little artists. In this variation on the traditional cumulative rhyme, a monster swallows ants, a lizard, a bat, and other creatures to try to cure a stomach ache than began when he swallowed a tick. He swallows progressively bigger animals until he tries to swallow a lion... Children will laugh, dance, and sing along with this delightful book. Retells the classic tale about a traveller, a ghost, who tricks a town's witches, ghouls, and zombies into helping him make soup, fulfilling his voracious appetite, and beginning a Halloween festival. Halloween can be especially spooky for a shy bunny. But when that shy bunny bumps into another shy bunny, friendship scares away fear. Once they join forces, not even the darkest night can stop them two brave bunnies from having the best Halloween ever. 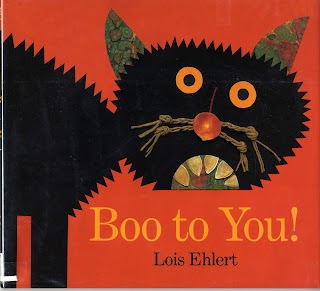 Full of sounds, spookiness, and sweetness, this dynamic picture book celebrates the best part of Halloween: friends! What do monsters eat? 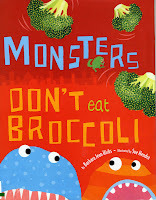 In this rollicking picture book written by Barbara Jean Hicks and illustrated by Sue Hendra, monsters insist they don’t like broccoli. They’d rather snack on tractors or a rocket ship or two, or tender trailer tidbits, or a wheely, steely stew. But boy do those trees they’re munching on look an awful lot like broccoli. Maybe vegetables aren’t so bad after all! 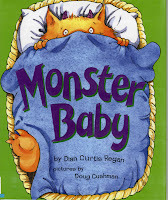 This hilarious book will have youngsters laughing out loud and craving healthy monster snacks of their own. Just the right mix of sweet and scary for the youngest trick-or treaters. At the edge of town lives a clever girl with a spooky problem: Her house is haunted! Luckily, she happens to be a witch and knows a little something about taking care of ghosts. She catches them, puts them in the washing machine, airs them out to dry, and gives them new lives as sofa covers, table cloths, and, of course, bed sheets to cozy up under. Fresh and charming illustrations in dynamic orange, black and white bring this resourceful heroine and these spooky ghosts to life. He could push you really high on the swing. He'd never get tired of giving you rides on his shoulder. A Frankenstein would be the perfect new best friend. Maybe you could build one. . . .
Whatever you do, Do Not Build a Frankenstein! Mrs. Oliver's dreams have come true when her husband finds a tiny baby on the doorstep of their farmhouse. He looks like any other newborn—well, except for the fur, the tail, the pointy teeth, and the horns. But to Mrs. Oliver, he is beautiful. Olly begins to grow at an alarming rate, and in just three days he's big enough for kindergarten. He makes friends with the children at school, but his size keeps getting him in trouble . . . until he realizes all the things it allows him to do. After graduating from college two weeks after coming to live with the Olivers, Olly is adopted by his new parents. Even better, someone new—and equally unusual—moves into the farm down the road. For slightly more mature and adventuresome readers, try this new graphic novel series. Magic Trixie is an adorable witch who attends a magic school with her best friends (werewolves, vampires, mummies and more) all the while dealing with not-so-magical problems, such as a baby sister who seems to get far more attention than she does and finding the perfect trick for show or tell. Kids will laugh and relate to Trixie in all three volumes of this fantasitc new series. The next installment on my series of book clubs for first through third graders features the classic book, The Littles by John Peterson. Because of book availability we read either The Littles or The Littles to the Rescue. This was the best attended book club we have had, and the most popular book. I remember loving these books as a kid, and they're still popular. After book club, every copy we had of any Littles book was checked out and I could have checked out three times as many. I actually did this back in November of last year, so that is how far behind I am on this blog. Here's what we did for our book club. What Little family member are you the most like? How? Why do you think the Littles only take what the Biggs are done with? Is this like recycling? Bonus How can we recycle and reuse things at home? Why do you think the Biggs have never noticed the Littles? If you were a teeny little person, what would you "borrow" from your big house? What would you use for a bed? Blankets? Dishes? Tables? Lucy and Tom Little don't go to school. How do you think they learn? Are the Littles brave? When were they brave? What would be harder if you were noly five inches tall? What would be easier? The Littles use postage stamps as art. I went to the post office to buy post stamps that looked cool and didn't have a lot of choices. I remember there being tons of choices as a kid. Fortunately I had an envelope at home of "pretty" stamps that are all the wrong denomination. I recommend asking your staff/family/friends for donations of "old" stamps (not valuable obviously) for this. We "mounted" the stamps on colored cardstock and made "frames" by gluing on colored toothpicks. I, naturally, had cut the colored toothpicks in half the day before. I also had blank spine labels and allowed them to draw their own miniature paintings. We used small strips of paper folded accordian styles and stapled between cardstock to create books. I had printed book covers in teeny miniature versions. Or they could draw their own cover on blank cardstock. Very fun and popular. I used the recipes on the fantastic Hamster Tracker in their Cooking for Lucy section. I made and brought in a few examples (the little burgers and little pizza) and sent home instructions on the "take home fun and activities" sheet. I used a picture from the site, and received permission from the site's author who was quite kind about it. I encouraged the kids to make their own at home since we don't do food here at the library. But it would be a fun group activity if the cutting was done ahead of time by an adult (naturally). I sent home a "Take Home Fun and Activities" sheet. It included the "micro-burgers" recipe and picture, a list of The Littles books, and instructions to decorate a "Little" house.